Amick’s son, Justin, recently struck out with business partner William Stallworth to open the Painted Pin, an ambitious bowling alley compound located in Buckhead’s Miami Circle. 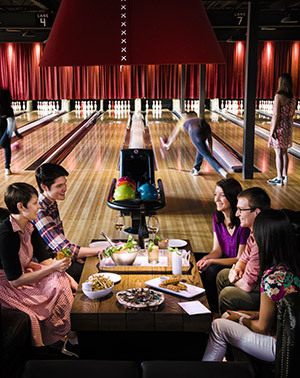 Really, it’s bowling on the upscale, where vintage brown leathers, chesterfield sofas, and dramatic spotlighting fuel a preppy British vibe in an industrial warehouse. Side games like bocce ball, a live DJ, and a loaded beverage program make this the ideal spot for late-night revelry. Don’t like bowling? Two bocce ball courts, a pair of pingpong tables, and a live DJ should hold your attention. Expect craft cocktails and smart wines from Amick, who is a certified advanced sommelier. Stay primed on satisfying pub grub like fries with pesto aioli, a beef frank coated in a malted waffle batter, and wood-fired pizzas. ‣ Must be 21 to enter after 7:30 p.m. This article originally ran in our August 2014 issue.